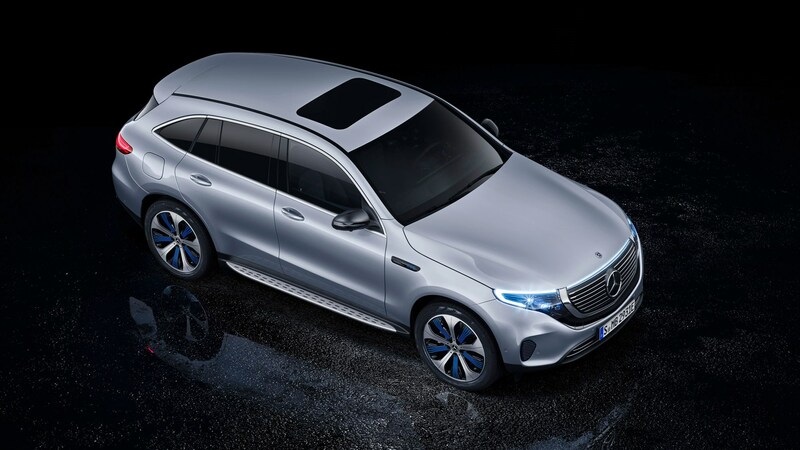 Not content with launching the GLB Concept over in Shanghai, Mercedes has also revealed this; the EQC 1886 edition over at the New York motor show. An EQC dripping with optional extras and a few cosmetic tweaks, the 1886 is essentially a launch edition of the standard car. Aside from a tick against all the options and after sale services, not much. The 'radiator' grille gets a mean high-gloss black finish, and the three-pointed star gets the same treatment, too. The EQC's 10-spoke 20-inch alloys get the same treatment, and the entire car is available in an exclusive high-tech silver hue. It certainly gives the conservative EQC and injection of some much needed interest. Inside, the 1886 edition gets new sear designs and special badging in the backrests and centre console. Neat, but not essential. More useful are all the additional after sales packages also thrown in. Maintenance service gives customers all work for six years or 150,000km goes free for example. In addition, a Pick and Delivery surface also means the the EQC will be picked up six times for repairs, also for free - though you'll need to be within a catchment area of your local dealership. Keep reading for more on the EQC. 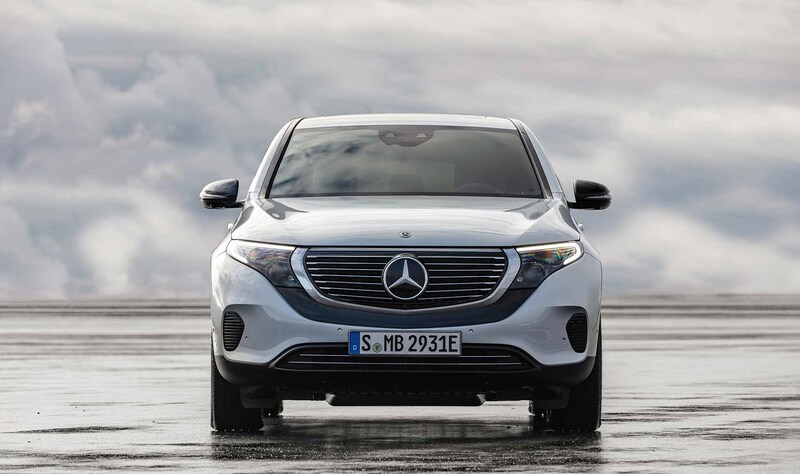 After years of roadmaps, presentations and promises, Mercedes has revealed the EQC. 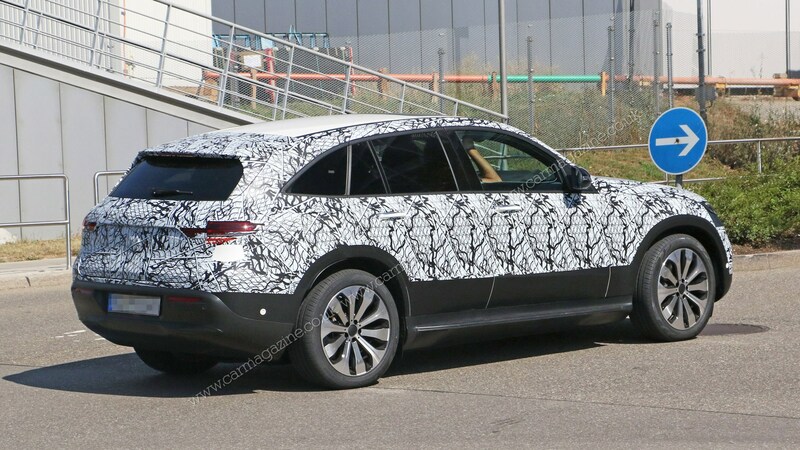 It’s the first car from Mercedes’ EV-only 'EQ' range and it’ll take on the Jaguar i-Pace, Tesla Model X, Audi e-Tron coming later in September, as well as BMW’s iX3 expected in 2019. 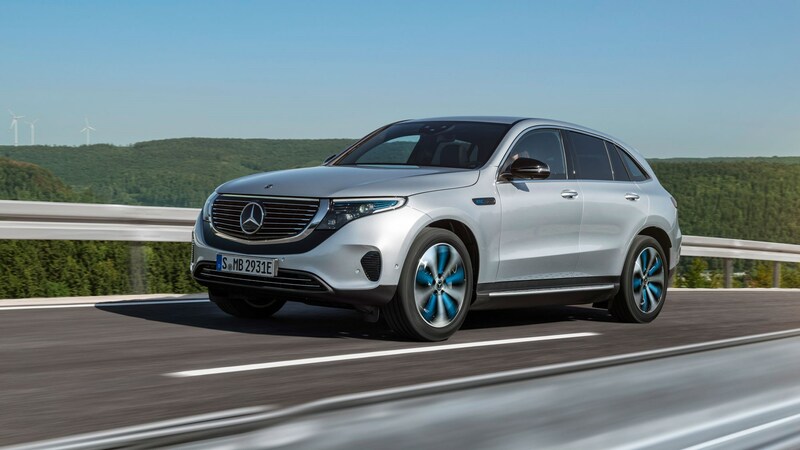 The EQC is also part of Mercedes’ plan to roll out a whole range of new electric cars between now and 2022, with one pure electric car under the aforementioned EQ banner joining the range each year. 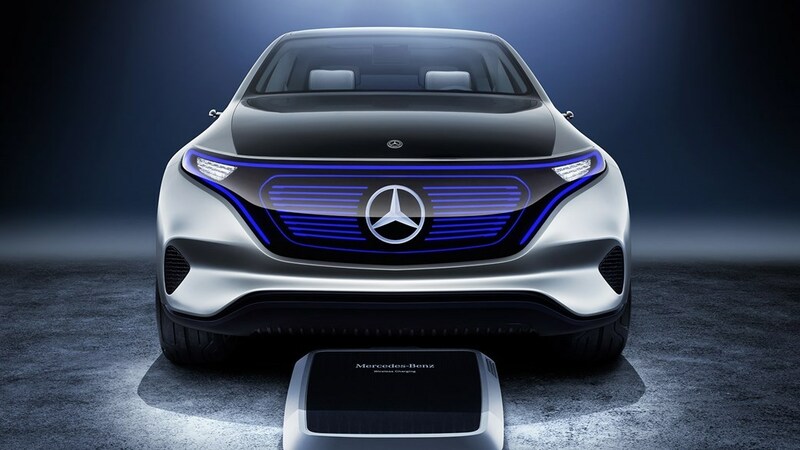 Ola Källenius, Mercedes group boss of R&D, has also confirmed a pair of electric saloons, likely called EQ E and EQ S. Mercedes predicts that between 15-25% of its car sales will be electrified by 2025. 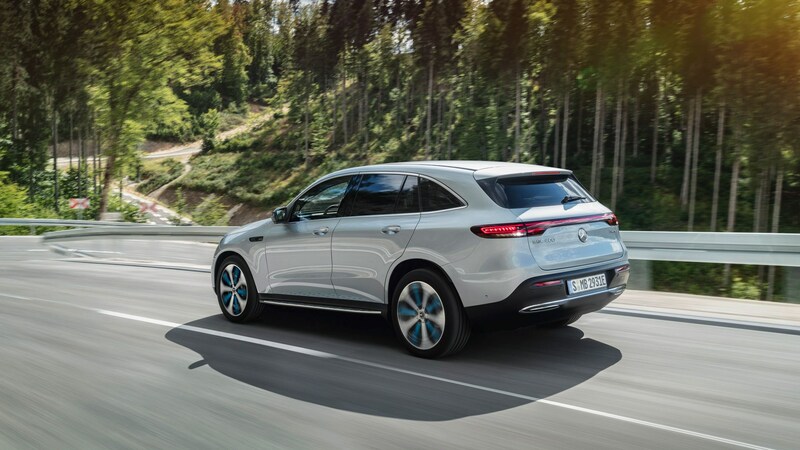 The silhouette of the electric EQC mimics the current GLC family crossover (no surprise, since that spawned the EQ Concept revealed at Paris in 2016). 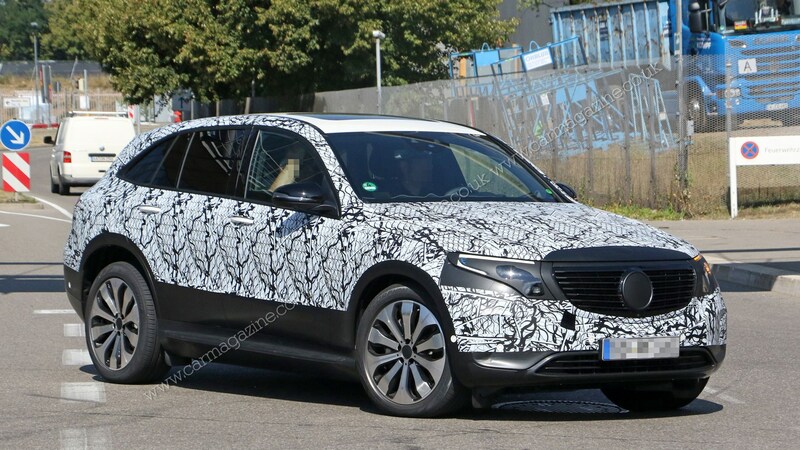 Gone is the glowing blue grille of the concept (disappointingly), instead replaced with a showy - and vast - grille flanked by a black gloss panel that houses the LED headlights. There are still flecks of blue in the headlight lenses and the wheels on the show car, mind. Rims between 19 and 21-inches in diameter will be available. Lighting is a key element, too. 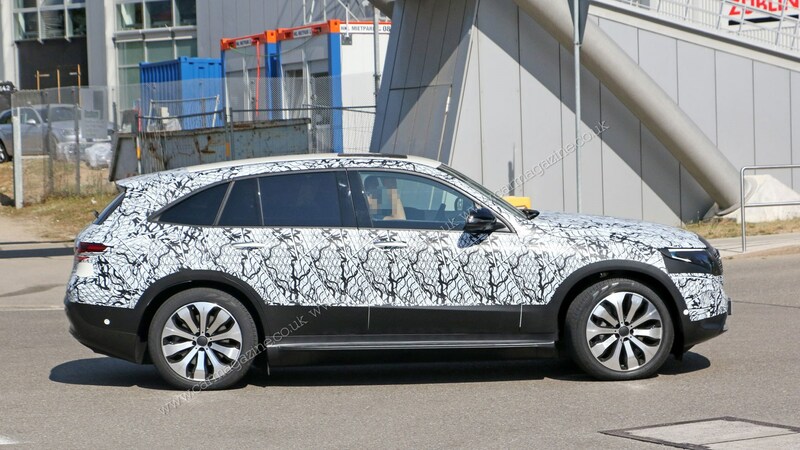 In certain markets, there is an extra light bar at the top of the grille that connects the two curved signatures together, which is then carried over to the rear, with its singular lighting unit (a growing trend across many - largely German - premium cars, it seems). 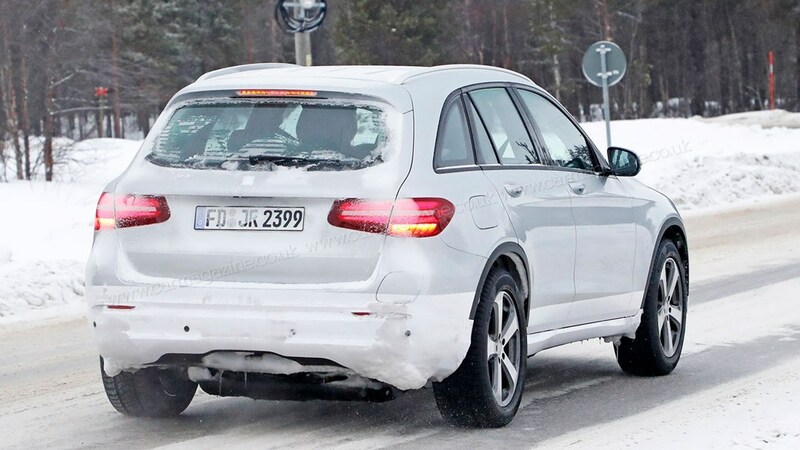 Lesnik says this singular rear light bar will be carried across on future models. 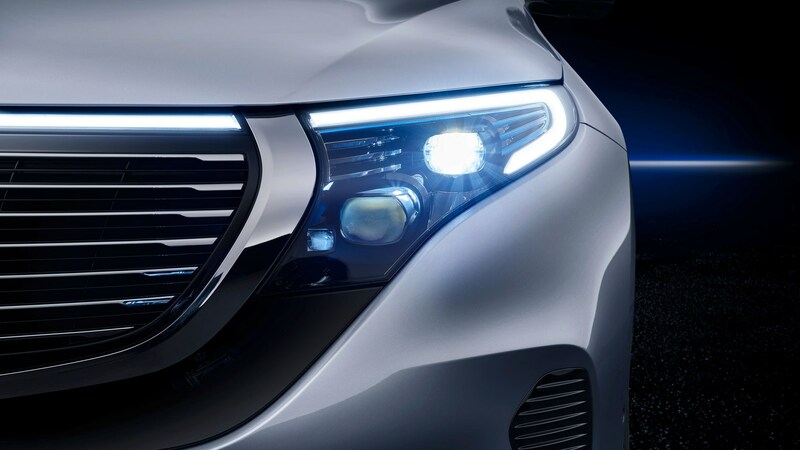 Also, the three-pointed star on the front can light up when the brand's Distronic adaptive cruise system is active. And what about the Merc EQC interior? It's mostly familiar cabin fare in here, too. Merc has crammed in the latest components from its most recent new car releases, with the steering wheel from the updated C-Class range featuring alongside the new touchpad control system for the twin-screen MBUX infotainment first seen on the fresh A-Class. It’s not all been there, done that, though. 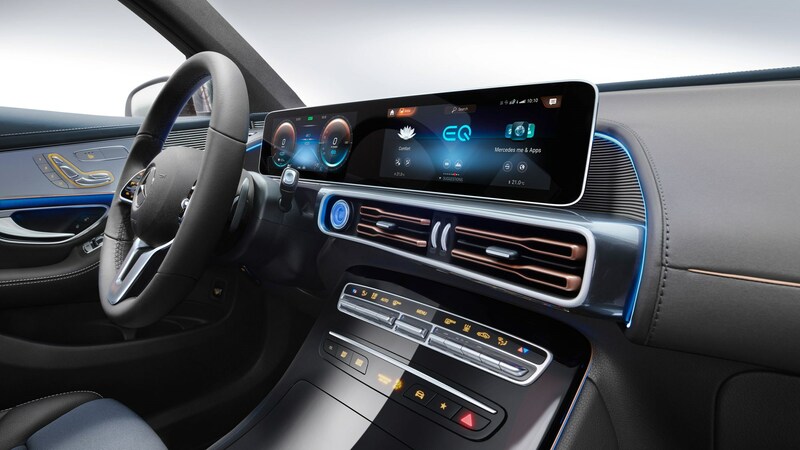 The EQC includes rose gold detailing on the air vents, for example, and a louvred display housing that ‘resembles the cooling ribs of hi-fi amplifiers,' according to Hartmut Sinkwitz, director of interior design. 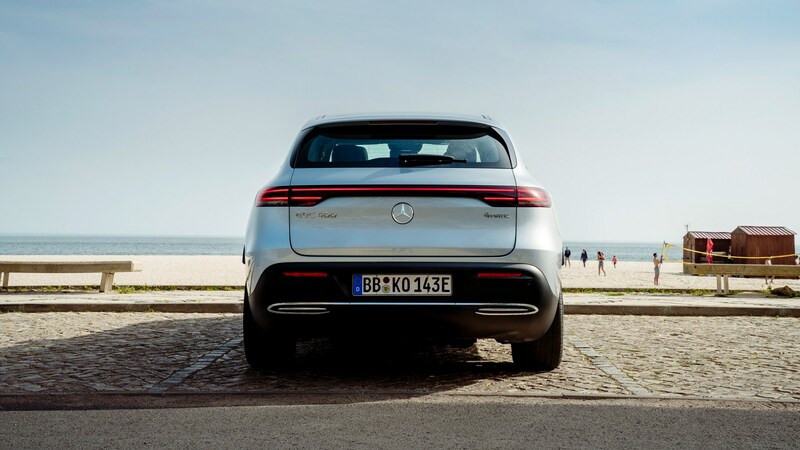 Merc’s MBUX infotainment system has been tweaked for the new EQ range, with pre-conditioning functionality and navigation that has been optimised to plan routes that include charging stations if you need a mid-travel zap. There’s the usual suite of Merc’s active safety equipment available, too. 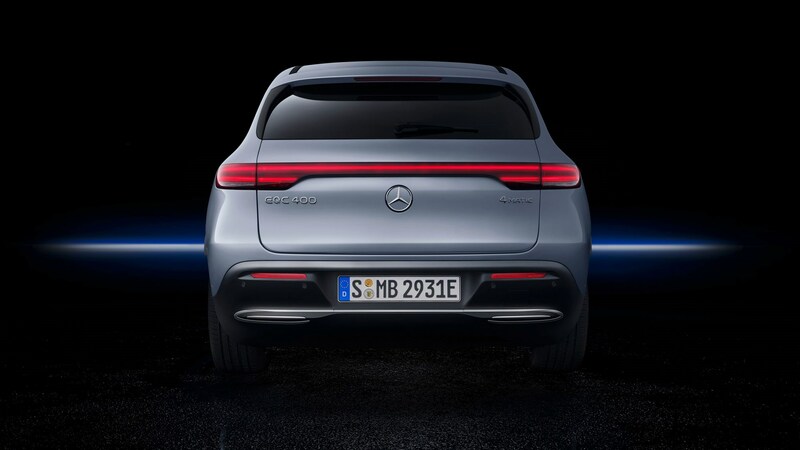 As for space, Mercedes has pointed out that the EQC comes with a 500-litre boot. This should be a practical everyday family car. What about the range, specs and performance? 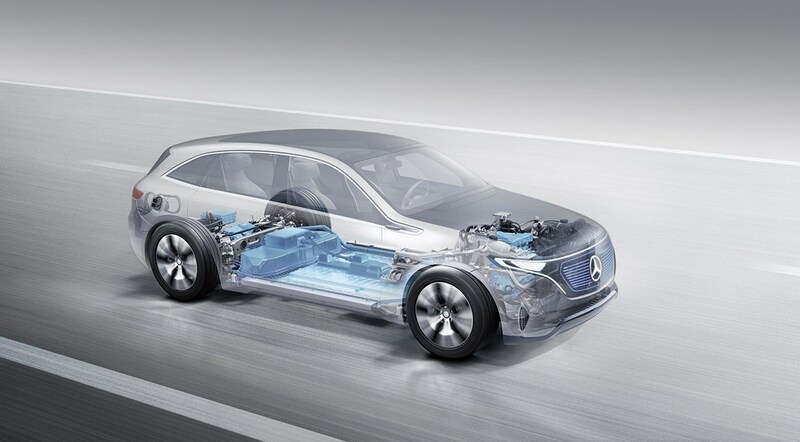 There’s an 80kWh lithium-ion battery pack that’s linked to two electric motors – one on each axle – for zero-emissions all-wheel drive. Mercedes-Benz says there’s 300kW of power on tap (402bhp and 564lb ft in Church of England measures) with a 0-62mph sprint over with in 5.1 seconds – just 0.2sec slower than the AMG GLC43 – and a top speed limited to 112mph. 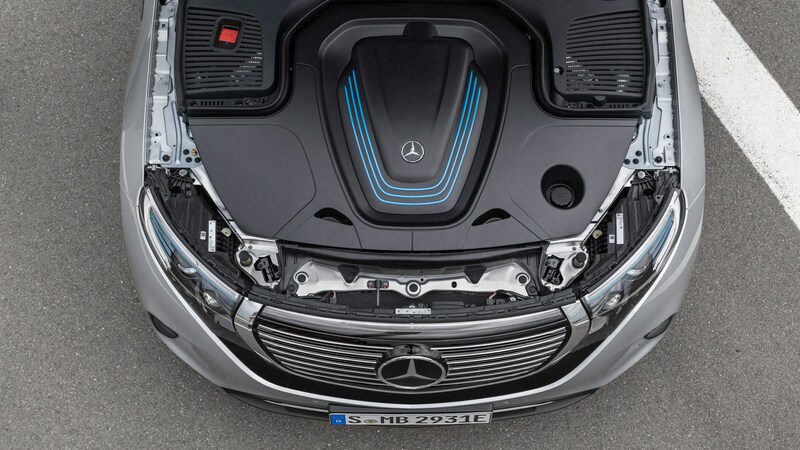 Mercedes also claims around 450km (280 miles) of range on one charge. Oh, and if you’re into that sort of thing, the EQC is able to tow up to 1800kg. 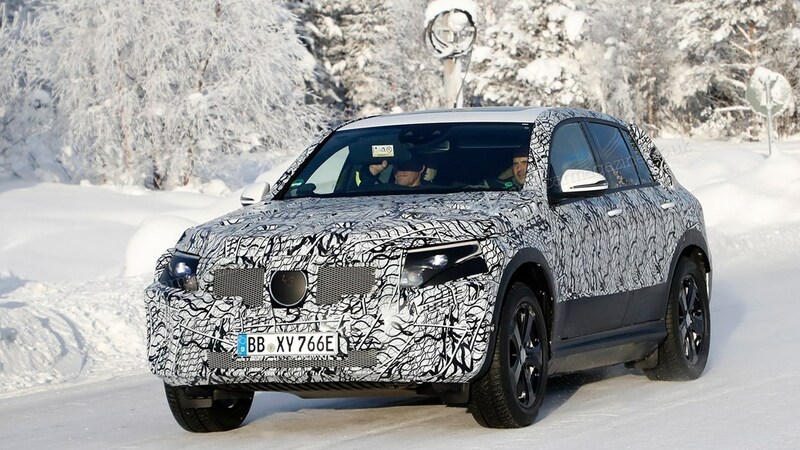 EaA story on Carscoops revealed why the Mercedes EQC doesn't have a front trunk or 'frunk' – Mercedes instead places the car's electric motor where the ICE would be. It's this lack of engineering and design constraints that make the EQC's, Jaguar i-Pace rival such an interesting proposition. 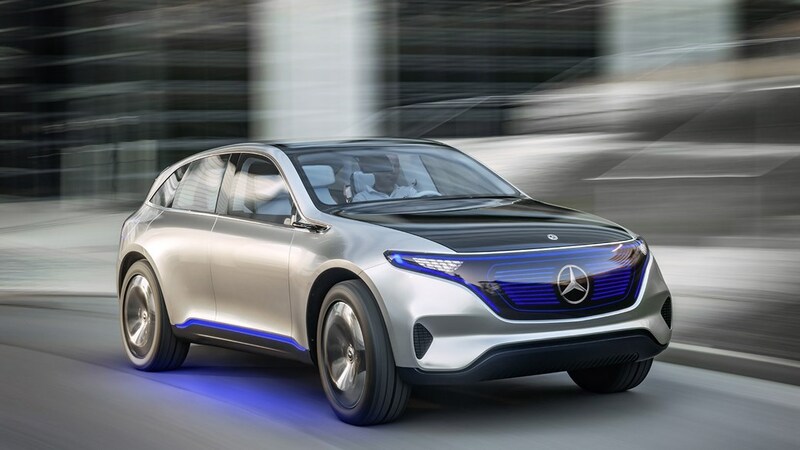 However, Mercedes must believe the cost-savings outweigh the possible design losses. 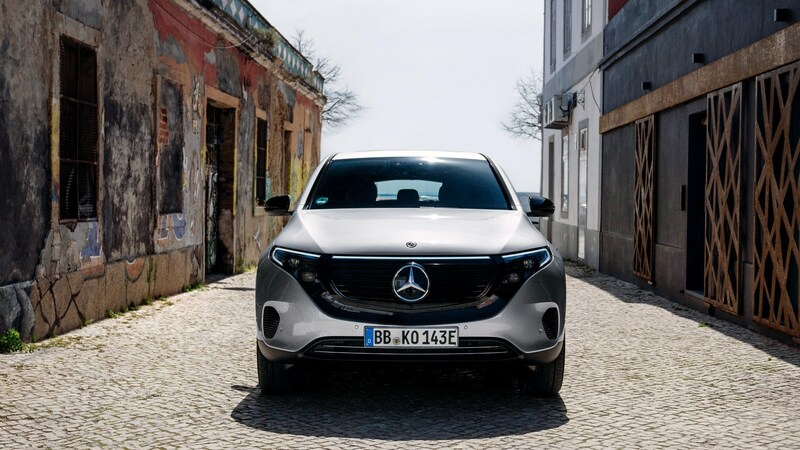 How do I charge the electric Mercedes EQC? 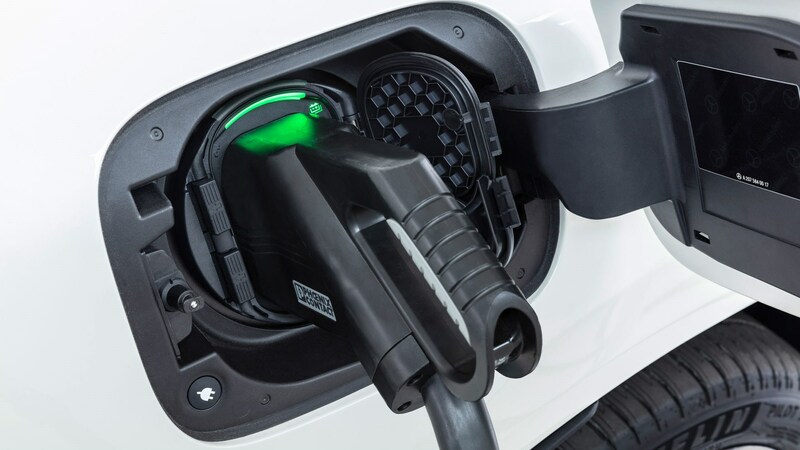 There’s a 7.4kW onboard charging cable – standard fare in any modern electric car – and it comes with a CCS-format plug socket in Europe and the USA (Japan gets CHAdeMO, China uses GB/T) for fast charging. 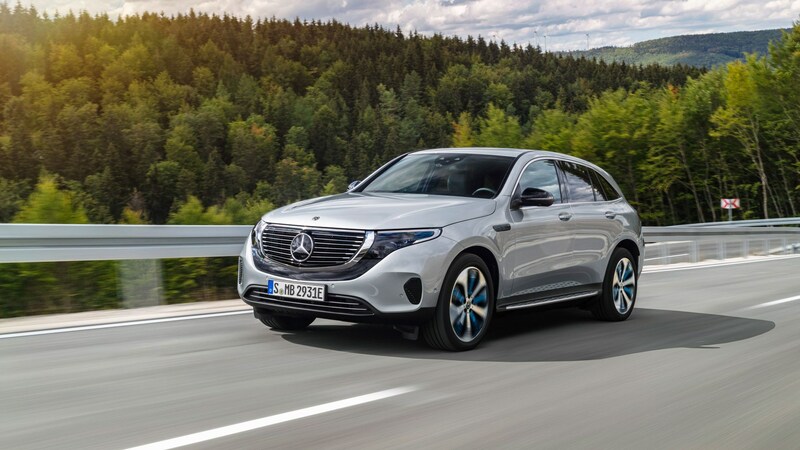 The maximum charging output the EQC is comfortable with is 110kW, and Mercedes claims a charge from 10% to 80% full takes around 40 minutes at maximum power capacity. So it's not immune from the chicken-and-egg question of infrastructure, but the EQC is equipped to deal with all current recharging possibilities. When can I buy an EQC? 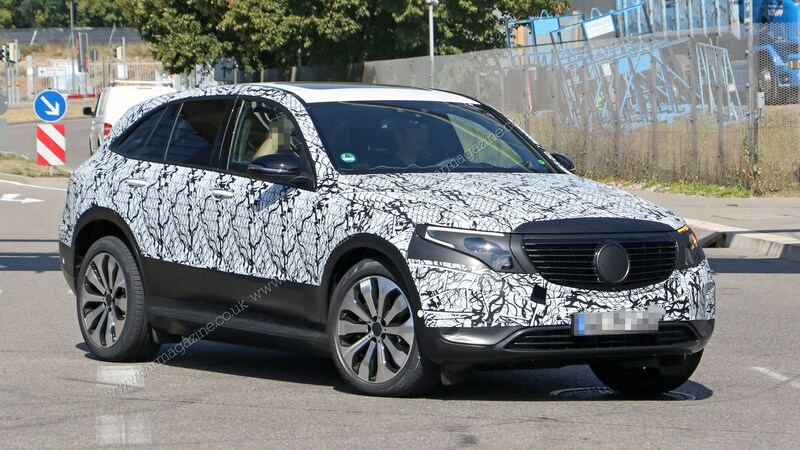 The new EQC will go on sale in spring 2019, with the first cars coming to UK dealers and buyers towards the end of that year. There will be two trim levels available: Electric Art and the familiar AMG Line. Prices haven’t been announced yet, but it’s fair to guess around £70,000 – in the same ballpark as a Jaguar i-Pace.